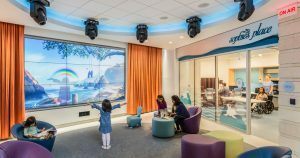 Lucile Packard Children’s Hospital (LPCH) Stanford in Palo Alto, California, has won an Award of Merit from ENR California Best Projects 2018. LPCH won in the Healthcare category for northern California. Designed by HGA (Executive Architect and Medical Planners) and Perkins+Will (Design Architect and Sustainable Design), the hospital achieves key goals established by Stanford Children’s Health—all focused on creating America’s most technologically advanced, family friendly and environmentally sustainable hospital for babies, children and expectant mothers. The 521,000-square-foot building more than doubles the size of the existing pediatric and obstetric hospital. The new Main building includes a bridge corridor connected to the existing building, 149 patient beds, surgery, radiology, imaging center with combined PET/MRI, interventional and catheterization labs, and nuclear medicine. Judges reviewed more than 100 projects throughout northern and southern California and Hawaii. Projects were evaluated on the ability of the project team to overcome challenges, contributions to the industry and community, and safety, construction and design quality. For more information, visit ENR California.